Before this film, I helped a friend of mine in the edit, sound design and visual effects for his short film ‘Pause’ in which I acted as well. And the film had a very warm response from the audience. We decided to make one more short film, which failed miserably. I had a really clear idea about the story of the film and the dialogues as well. But for some reason I couldn’t convey it very well. My friend slept the entire afternoon and I was demoralised. I realized the importance of having the script in writing. Even when you are writing, directing, shooting and editing the film on your own, you are not the only mind working on it. When you direct your actors, they give their suggestions. They may be brilliant but not in sync with the demand of the script. When you have your script in your hand you can simply ask your actors to stick to the plan when it is necessary. It is very important for the director, the captain of the ship to have a command over his vessel. A hard copy of the script in your hand is your map, your compass and your wheel. I also had a very simple shot division plan and a storyboard this time. I borrowed a camera, a Canon 550 from a friend of mine, a 50mm 1.8 lens from another friend in a different part of the city, I asked my dad and a friend of his to act and was all set to shoot. 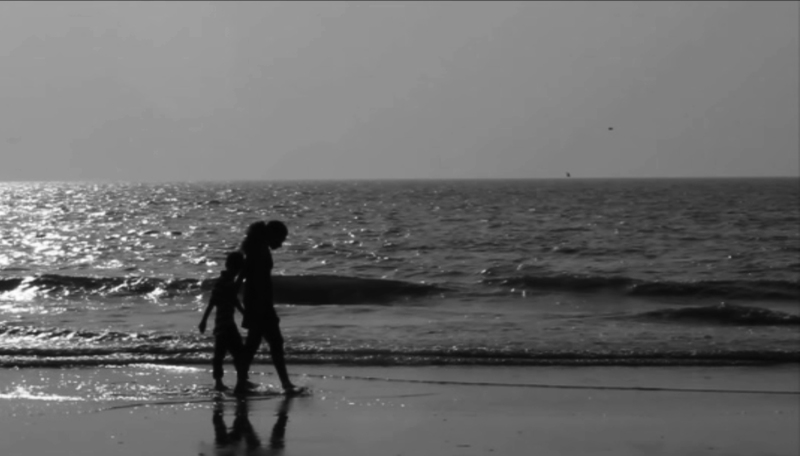 The shoot was in the afternoon at Juhu beach and I was running around everywhere since morning. When we reached at the location it struck me that I forgot my script at home! I hadn’t explained the script to the actors by then. But we were losing light. We had to start. So again, even this time I was without a script even after writing it so precisely. I struggled while directing but everything was alright. I had to come back on the next day to take a few inserts. The treatment changed drastically on the edit table. But I am glad we could finish this. The film was screened at Usha Pravin Gandhi College during Aahan International Short Film Festival in January and that was my first screening. The film got the second best film award and thus it all started. The film was screened at a few more festivals in 2012. I tried sending the film to Berlin Short Film Festival but it couldn’t work out. Quite recently, all of my films were screened back to back at My Mumbai Film Festival. I couldn’t go for the screening but my mother and my younger brother did. My brother said that out of all the films, Argument received the best response. By many aspects, my work after this film was more substantial for me in terms of quality and reach as well. But I think the first step, the first boost was essential. As I look back, when I made the film I did not know whether I was shooting at 24 fps or 25 fps. I spent at least 15 minutes in changing the lens, which doesn’t take more than 5 seconds. I almost lost my friend’s SD Card. I was turning the focus ring when it was on auto and I thought I broke it. There were so many retakes just because I kept my tripod in the frame. And many more mistakes, which taught me more than any institute would have.